Some random intro by Citizen Z before we move to Hannibal, Missouri and a church. A zombie church – which has captured zombies, rings the bells to call more zombies and, it looks like, possibly feeding parishoners to zombies. To the gang and everyone’s noticed that Murphy isn’t looking his best and it’s possible there’s something up with the vaccine. Of course, this being Z Nation such worry leads to Warren calling dibs on the one who gets to kill him. The gang is running out of supplies and has eaten so they’re on their way to a town/compound/base to resupply (and, yes, Doc makes a cannibal joke to Cassandra because Z Nation). On arriving at the compound they find a less than enthusiastic welcome and a demand to surrender all guns. Garnett asks to see a Major Joe Williams who he has known since before the apocalypse. Joe does know Garnett and greets him happily – they can come in but not the truck and not the weapons. While they do that, one of the Major’s followers tells them 3 of “Jacob’s cult” have come back – and we see the three people who looked like they were going to be sacrificed to zombies begging to return. Joe accepts them back, though he’s not entirely thrilled. Meanwhile one of the returning cultists goes wandering and 10K decides to follow her – he sees her propping open the zombie-proof doors. Jacob and his cult approach the fence looking all ominous. Inside, the woman collapses in front of the gates, having dropped her large cross. Another cult member, Luke, asks to see his ammo bag (more large cross fondling). The last cultists decides to start preaching in the dining room. The crosses hide blades – and he uses his to cut his own throat. He becomes a zombie and starts biting people (everyone looks around frantically for a weapon which is laughable considering the chairs they’re sitting on). At the gate, the collapsed cultists rises and bites the woman who opens the gate to check on her. Lots of people then do stupid things like grabbing a zombie and hugging it to their chest. All the zombieness interrupts Warren and Garnett at a very terrible time. Even if it weren’t zombies, I think Warren is allowed to kill them. Unlike everyone else in this compound, Warren realises you don’t actually need guns to kill zombies and grabs a table lamp. There is a zombie outside and Garnett kills it by slamming its head into a wall. Zombies run amok everywhere – chaos and horror and death and no-one doing much to defend themselves – and one attacks Murphy. Or grabs Murphy and looks at him before moving on. The rest of the group are the only ones who realise the wealth of zombie killing utensils all around them. including a hand whisk – oh dear gods the electric hand whisk. Warren and Garnett move through the empty corridors wielding hard backed books and Warren sees where the doors have been wedged open. They run into Joe who tells them about the suicide attack. Unfortunately they also learn all the guns are in one place that is full of zombies. The group gathers – missing Murphy and 10k. Joe tells them the emergency exit but he’s determined to stay and help his people. Hordes of zombies run through the halls, killing one poor woman with Murphy – they all ignore him. Jacob and his cultists take the armoury and he orders them to bring him the “blasphemers” alive. They’ve also blocked the emergency exit. The gang and several other members of the compound are crushed trying to get out – with zombies coming from behind. Yes that sounds pretty hellish – in fact it’s utterly nightmarish. Addy starts to have a flashback – and 10k unblocks the door from the other side. The gang gets out, the zombies get locked in, everyone else behind them was just ablative flesh keeping the zombies off. They run off for weapons and Jacob’s followers take them prisoner – except 10k and Cassandra who run. Jacob decides to test this further by shooting Murphy – Garnett jumps in the way of the bullet and 10k, on the roof, kills Jacob and several others. Murphy frees them while the zombies escape and Cassandra drives up with the truck. Warren runs to Garnett, dying from his bullet wound… he gasps that he loves her and passes out. Doc and Mac drag her off his body so they can escape. As they drive off, we see his eyes open, clouded red. Afterwards we see a zombie Garnett – and Warren kills him, announcing she gives him mercy. She also shoots and wounds Jacob, so the zombies can eat him. Ok… that was unexpected. 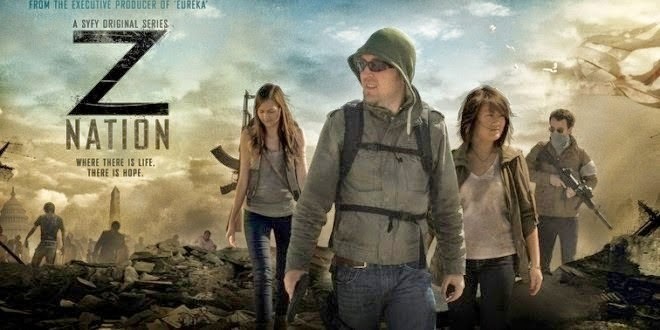 I said last week that it seemed strange that Z-Nation was swinging away from it’s silly, campy, highly ridiculous beginning and becoming more serious – because I don’t think it can balance the zany and the deep and serious well. And then we have this episode which hardly even tried for the zany (sure the zombie cult was weird and stretched belief – but they weren’t SILLY and they weren’t funny). And by killing Garnett, they’ve established themselves as the ultimate “anyone can die” show. Even the Walking Dead won’t kill Rick! Given the ubiquitous nature of the straight white male lead in so many of these shows, I never expected Garnett to die, especially after Hammond died in the first episode. So where do we go from here? Will they have a leader? Will we interspace zany with heartfelt goodbye scenes, trauma and giving people mercy? Is zany gone for good? What is happening? !